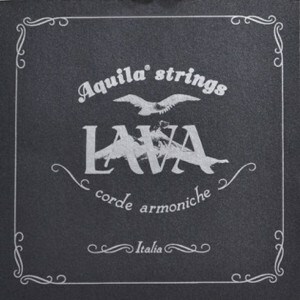 The Lava Series strings maintain the same identical mechanical and sound properties of Aquila's famous white-pearl Supernylgut ukulele strings. 2 Lava Nylgut and 2 wound string set with a low D.
Strings arrived promptly and as ordered. Love the sound they give, warm, great for strumming! My only issue is the D strings goes bad early. Otherwise would be 5 stars! Q: Is this a high or low D ? A: 2 Lava Nylgut and 2 wound string set with a low D.